Sweffling is a lovely little village in an area of lovely little villages. Its church sits in hilltop splendour, clearly a successor to a fortified building, perhaps even a pagan site. The churchyard rises above the houses, two of which flank the entrance. They must be fine places in which to live; the one to the left has windows overlooking the graves. A poster for the annual Sweffling v Rendham football match was pinned to the noticeboard, and these two adjacent parishes are traditional rivals. The view from the graveyard is gorgeous, of rolling hills beyond the cottages. This really is High Suffolk. Externally, this is rather a grand building, and looks old. There is obvious renewal along the top of the nave walls, and the tower doesn't look quite right; Mortlock thought it had been truncated. However, it is not unattractive, and adds to the impression of a strong and solid church. The best feature is the grand porch, so typical of Suffolk's 15th century flintwork. It is set-off well by the nave's red-brick walls. A wild man and a wyvern spar in the spandrels, quite clearly to me, although Cautley thought them St George fighting a dragon. There are three splendid crowned alcoves for statues, which, as so often in Suffolk, must have had very short lives before their removal and probable destruction in the 1540s. The 19th century cross surmounting the porch is a not-unpleasing addition. To step inside, then, is a bit of a disappointment at first, because the inside has been thoroughly Victorianised, but in fact this is an interior of some interest. The font is made of grey Purbeck marble. It's an off-the-peg job of the 13th century, with curved arches all around. I think it is an attractive example, despite the modern shaft. The font at nearby Farnham is a 19th century copy of this style. The decalogue boards are painted directly on to the north wall, but it is done so well that, at first, you believe them to be wooden. They are a reminder that it is not safe to assume these boards were always moved by the Victorians from behind the altar. These date from the 18th century, and are painted over an even earlier set. Despite the restored character of the chancel, the Y-tracery of the east window is elegant and seemly. Incidentally, I remember coming here about ten years ago and noting that parts of the chancel floor seem to be subsiding into the vault, which must have made going up for communion a rather tense affair. But this has now been put right. The most interesting feature of this church is to be found under the little ringing platform at the west end. This is Sweffling Museum, a collection of photographs and artifacts about people and events in Sweffling in days gone by. There is also available, with full public access, copies of the parish records and logbooks. How wonderful if all churches could offer this service! 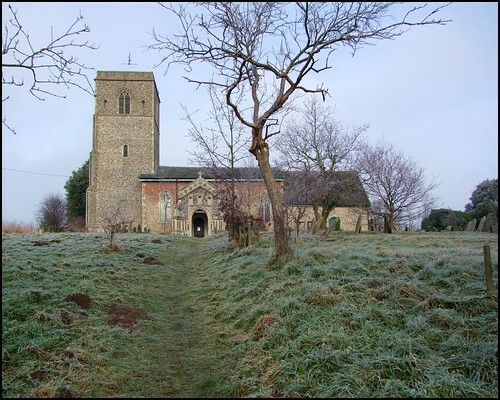 Perhaps this church is not one of Suffolk's glories. But it is a nice, friendly building, well situated in a fine village. So, who could ask for more?